Welcome to FarrarGreenHome.org, the official site for Farrar Green Home and Sustainable Farm, located in Escondido, California. Nigel and Rhonda Farrar are both scientists that enjoyed researching and selecting optimal green technologies and products for their Green Home. The purpose of this site is to help others build green homes by sharing their experiences with you. They have learned a lot about energy efficient design and sustainable building during this process and want to help others live in a more sustainable way. They hope their home will be a model for green design and building and that their sustainable farm will be a model for local sustainable family farming. In March 2008, the Farrars decided to build a new home with the goal of a net zero energy design, surrounded by a sustainable farm to provide a carbon neutral footprint. To do so, they assembled a team of experts with the knowledge, creativity and know-how to achieve these goals. 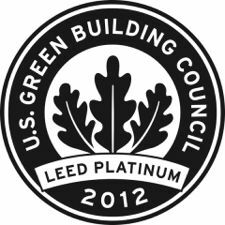 The home is now complete and LEED Platinum certified. The design and building of the Farrar Green home and farm will hopefully also be a model for collaboration with talented partners to create extraordinary sustainable homes. Construction began in the spring of 2010 and the home was completed in the summer of 2011. The sustainable farm is an ongoing labor of love. Explore the site to see the details of the home construction and how the LEED Platinum Farrar Green Home is a model for sustainable building and living. Sign-up to be notified of upcoming events at the Farrar Green Home. Farrar Green Home receives LEED Platinum Certification.from the US Green Building Council. The home is the greenest of the green! Farrar Green Home is featured by Reals Goods Solar. Farrar Green Pool complete! Let the swimming begin! The Farrar Green Home was featured in a TV Program on Russian Television (VGTRK), Television Channel "Rossiya-2" in Moscow. You may need to brush up on your Russian to get the full benefit of the experience! Moving day!! The Farrars moved into their new home. Let the planting begin! The Farrar Green Home passes it's Final Building inspection!! The Farrar Green Home hosted the California Association of Green Building Energy Consultants CABEC for their regional meeting. The Building Industry Association Green Building Event featured a presentation of the Farrar Green Home. Check out the most recent story written by Bradley Fikes in the North County Times. Rain-delayed 'green' home nears completion. SDG&E, AIA Palomar & CSI San Diego present a Green Home Tour at the Farrar Green Home under construction in Escondido. Click here to RSVP. Mark you calendars for the "Slab Party and Green Open House" on Sunday, May 23rd. To join the fun, RSVP at rsvp@farrargreenhome.org for details and directions. No it is not an April fool's joke! Check out the most recent story written by Bradley Fikes in the North County Times. CLOSER TO HOME: 'Green' dream house starts to materialize. Breaking news - Ground breaking, that is! Mission Valley Pools (www.mvpools.com) has been selected to build the Farrar Green Pool. Mission Valley Pools is renowned for their award winning pool designs and their expertise in energy efficient pools. What makes a pool green, you ask? The Farrar Green Pool will be a model of energy efficiency. 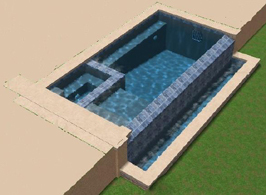 This green pool will have a Swim Gym, (www.swimgym.com) which provides a current at the push of a button. This allows one to have an infinite lap pool, in a fraction of the space. The smaller pool needs less materials, less heating, and less water. The pool will have a retractable cover that will keep the pool clean and reduce evaporation. And the pool and spa will be heated using the same geothermal heat pump, powered by the solar panels, that will heat and cool the Farrar Green Home! We have chosen a General Contractor! After considering 35 builders, speaking with 12, and inviting 4 excellent builders to bid on our project, we have selected Phil Gaitaud, Gaitaud Construction (www.gaitaudconst.com). Phil brings a wealth of experience building beautiful, high quality homes with an emphasis on thoughtful cost management. We are very impressed with Phil's work and the outstanding reviews he has from the homeowners for whom he has built homes. Two of Phil's current projects are on our street! We are delighted that he is in the neighborhood and expect that this will also reduce the carbon footprint of constructing our home. 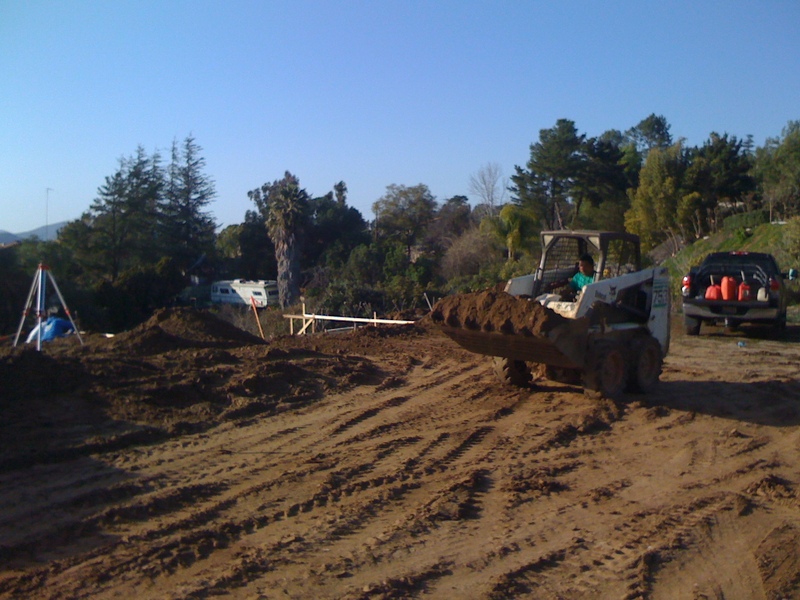 North County Times, Bradley Fikes has written an article about finding water and installing the first component of our geothermal system for our green dream home. ENVIRONMENT: Water strike advances dreams of green home builders. First installation of the new 300ft Kelix Thermocouple™ in So. Cal and one of the first 50 in the US. John Kidwell, inventor of the innovative Kelix product came from Oklahoma to oversee the 300ft ground loop system installed in the 300 ft. vertical hole. Everything went perfectly! 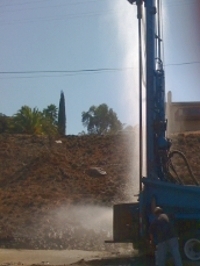 On the 4th day of drilling Tri-County Drilling found water at 650ft!! It looks like it will be enough water for the planned sustainable farm! YAY!! 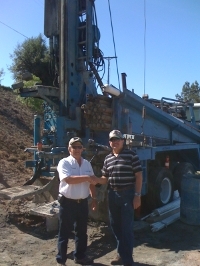 Drilling for well water will begin on September 24th! Well water is important for the planned sustainable farm. 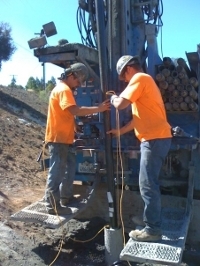 If there is no water, the hole will be used for a ground source geothermal loop for the home’s heating and cooling system. Nigel and Rhonda will be the first home in Southern California, and one of the first 50 in the US, to use the new Kelix™ Thermacouple™ Earth Energy System for their geothermal ground loop. This innovative product provides a significant improvement in heat transfer efficiency compared to traditional ground loops and requires half the drilling depth.